Last year I was taking an Uber (taxi service) to an appointment and, thankfully, the car wasn’t smelly with cleaning products or dangling air fresheners, but the driver had the radio on and I’ve found background noise difficult since I got sick. I asked him if he would mind turning it down because I had a migraine, which wasn’t exactly true in that moment, but I do get migraines and that’s usually a good excuse for the taxi conversation about scents and noise and why you have your sunglasses on and the window down when it’s gloomy and raining. Turns out, this man had to leave his 9 to 5 job because of crippling migraines and was really suffering until he saw a local neurologist. He said he was having a hard time with migraine meds and she put him on this mitochondrial supplement and a natural regimen that helped tremendously (my ears perked up at a random stranger talking about mitochondrial deficits causing migraines, so I bought the supplement right away, but haven’t gotten around to taking it in the last eight months). Of course, I wrote the specialist’s info down and, when I saw my therapist, I mentioned this doctor to him (my therapist sees lots of people with complex illnesses like mine and has a network of good doctors that he recommends based on feedback from patients). “Oh yes, I’ve heard great things about Dr. Murinova,” said my therapist, so that sealed the deal, I wanted to see her. “But she stopped taking new patients.” Somehow, though, I managed to slip in and get an appointment and, it was true, when I tried to reschedule it, she had nothing else open for the rest of the year, so I felt fortunate (and kept the appointment). There are some not-so-glowing online reviews of Dr. M, but most seem to center on her brusque demeanor. She’s Eastern European and has that sort of no nonsense approach, which doesn’t bother me at all. I quite like it, in fact. At one point, I told her it would be really difficult to wake up early enough to see the morning sun and she looked at me hard and said, “Do you want to get better or not?” Gulp. Yes, I want to get better! 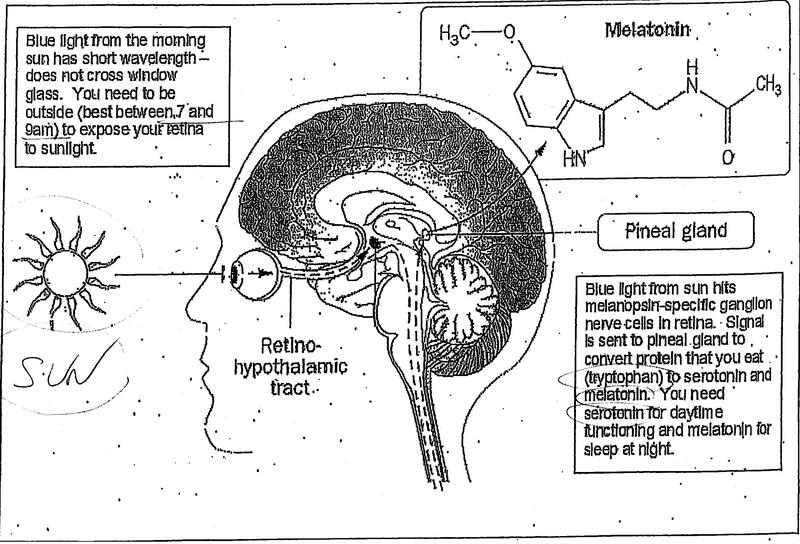 She said there was no point in eating good food and enough protein if you aren’t getting up in the morning because the blue light signals the pineal gland to convert protein to serotonin and melatonin (see her handout below). Her bluntness was effective. I haven’t managed to change my sleep schedule, but I certainly started taking it more seriously. She diagnosed me with: “Chronic intractable migraine, with status migrainosus and occipital neuralgia.” She also gave me a physical exam and then diagnosed me with fibromyalgia before we’d even talked about my primary illness. Believe it or not, that was the first proper hands-on work-up I’ve had for fibromyalgia since being sick — even during those early years of excruciating body pain. 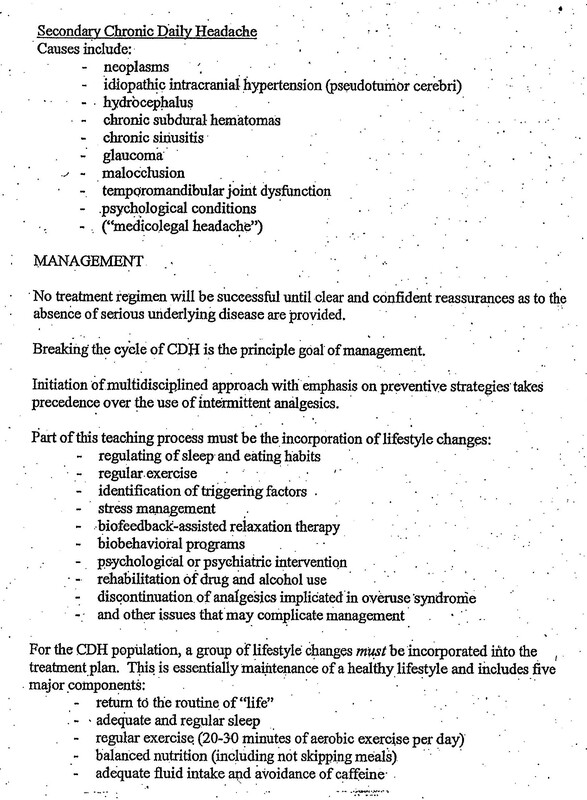 She said migraines are tied to mitochondrial insufficiency, IBS, fibromyalgia etc. and that low available energy kicks off the trigeminal nerve alarm which causes pain. 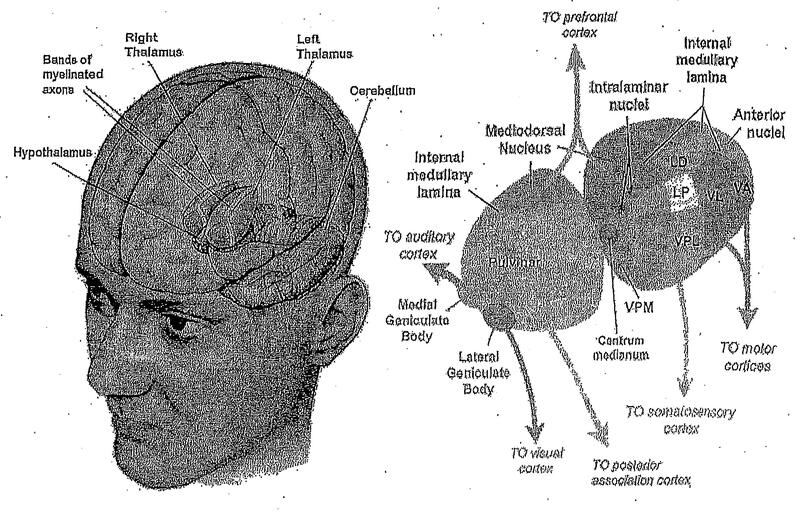 My genetic predisposition (my father has a long history of cluster headaches) coupled with central sensitization and not enough energy to power the thalamus properly = migraines. I thought she was very thorough and obviously extremely knowledgeable. I especially liked that she had a natural protocol and a medication protocol depending on patients’ needs. Below is the plan she gave me. I can’t say it is definitely her advice that has helped (I started immunoglobulin infusions right after seeing Dr. M), but my headaches have been much better in the last six months. Change my posture (shoulders back and scapula close together). She said it will feel unnatural, but bring the shoulder blades together as much as possible. I’ve been doing this. Yoga might help neck issues. Haven’t tried this yet. Aerobic exercise and build muscle to feed mitochondria. My goal. Good nutrition and enough protein. Try ish. Deep breathing, relaxation and other parasympathetic nervous system activities. I do these daily. Sleep better, but wake yourself up early for outside light from 7-9am to build serotonin (that time is very important for short wave light that feeds your brain; you need it to cross the retinas, but not through a window. She felt this was non-negotiable). I haven’t managed this, of course. No more Tylenol (more than one a week will perpetuate headaches). Now I only take it once a week for my immunoglobulin infusions and on the rare occasion of a bad headache. Drink up to 3 cups a day of feverfew tea (she thought this was most important. She has weaned patients off migraine meds with this tea). I drink it daily. Consider SAMe (200mg/day), yarrow formula, magnesium, coq10, riboflavin (I already take the last three), other B vitamins (B12 shots are a possibility for a boost). A device called Cefaly, which works on the trigeminal nerve to break the feedback loop and is proven to greatly reduce migraines. $300 out of Costco in Canada. 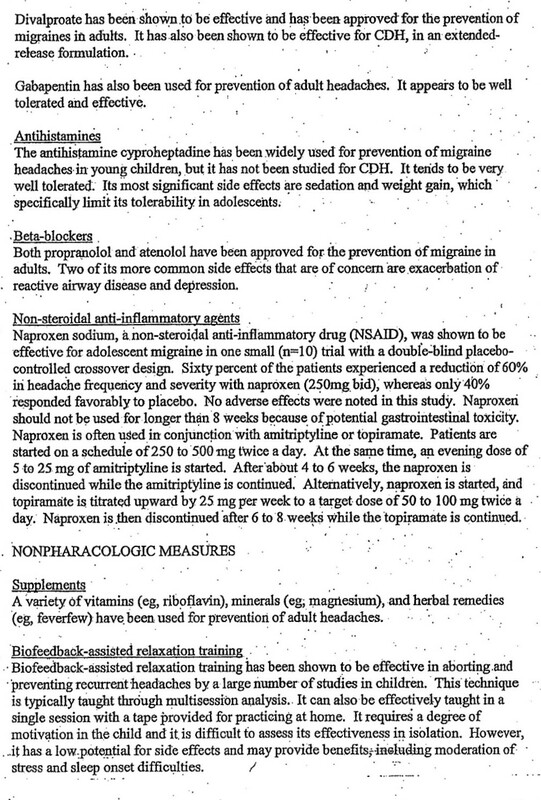 Instead of Tylenol, consider low-dose Lyrica as bridge drug, not a permanent therapy. Book: Chronic Pain and Fibromyalgia by Stephen Stahl. The study she gave me is great reading. It also suggested acupuncture, oxygen, capsaicin and butterbur, but she didn’t specifically mention those. This entry was posted in CFS/ME and tagged diet, doctor, drugs, feverfew, headache, M.E./C.F.S., ME/CFS, migraine, mood, muscles, myalgic encephalomyelitis, neurologist, pain, posture, protein, sleep, specialist, sun, supplements, symptoms. My migraines (2 per week, every week for years) plus a daily headache improved dramatically when I became allergic to paracetomol and had to stop taking it. Was horrendous for a month or two then my migraines lessened to around 2 per month from 2 per week! All very interesting. I have a problem with migraines too, and now have a Daith ear piercing which I think has helped. Interesting about the morning light. Great information! As a fellow migraine sufferer, I am going to add feverfew tea and the morning sun to my routine. I’ve been working on my posture due to a shoulder injury for a few years and have found that yoga helps with the arthritis in my neck. I do have one question though. How much time do you let the morning sun (sans window) meet your eyes? I have to assume it is not the full 2 hours! I just ordered Feverfew tea, Lemongrass is supposed to be good for mast cells too right? I think I had read that lol. I think it is really interesting about the morning sun routine she suggested! I am usually starting my morning nap about 7am but if I can muster up the energy next week I might push myself to sit outside for a bit about that time instead. 😊 I’ll let you know how it goes 😉. Thanks for sharing! What a wonderful writeup. I, too, would love to be a morning person…. easier said than done! My neurologist has suggested butterbur, however it can affect estrogen levels, so I would need a different birth control to control my cycle (I take it continuously). 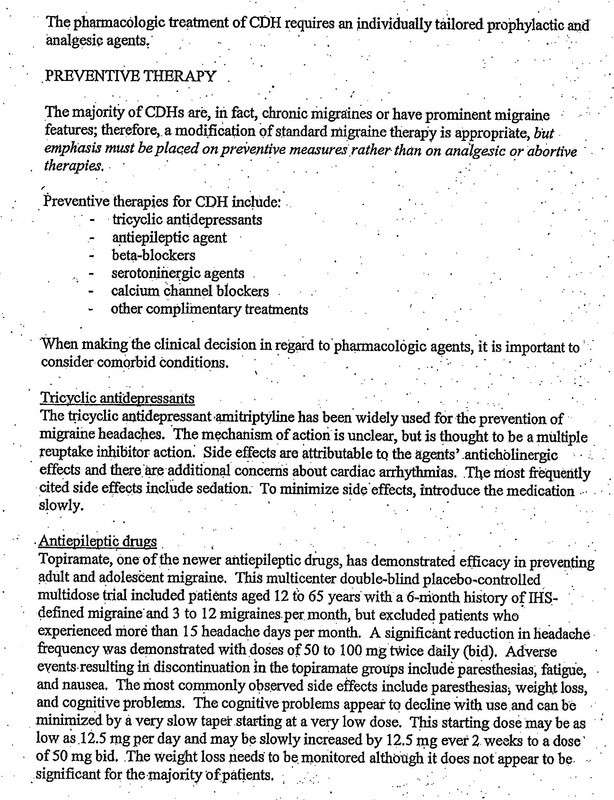 I have only had migranes a few times – they are so horrible to go through. That’s really interesting about the blue light waves not making it through the glass – I’ve been wrestling my sleep cycle into a more manageable pattern, so I’ll add this to my repertoire!